From the company that brought you the totally redesigned 2014 Civic Si, and the technologically groundbreaking 2015 FCEV concept car, comes an Accord based brake and engine regenerative hybrid; claiming combined estimated MPG in the 45+ range. Mileage unheard of in a mid sized luxury sedan. Green Car Reports and others have named the 2014 Accord Hybrid “ the car to buy” in 2014. As skeptical as I am of E.P.A. based mpg claims, independent road tests to date confirm Honda’s mileage claim. While that’s not the only attribute that consumers look for in a hybrid when pulling out the checkbook, it does begin the ( I want it) conversation at many a dinner table. Released to the North America market October,31, the Honda Accord Hybrid is quickly gaining market momentum in the rarefied world of mid sized hybrid sedans. Those readers eager to compare the Accord to the Toyota Camry and Ford’s Fusion, may be pleasantly surprised by the price point of the Accord as well as the upgraded electronic and mechanical features offered on the 2014 model. 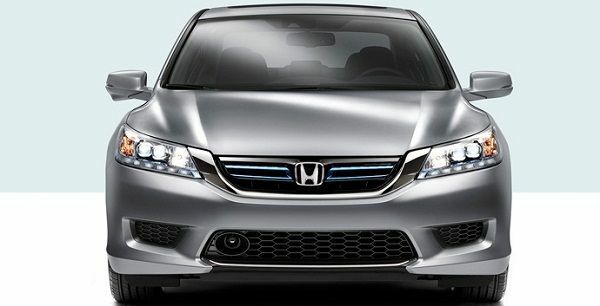 Cosmetically, the Accord Hybrid is an Accord; the flagship of the Honda sedan lineup. An easy to look at; comfortable; daily driver. A decent ride with a 100,000 mile tune-up cycle. When test driving the Accord Hybrid, most will be impressed by the seamless transition between electric and gas motor engagement, because it rarely happens. The only time the gas motor is directly engaged to the front drive wheel is when the car is accelerating at highway speed. The gasoline motor spends most hours acting as a low rpm generator/ battery charger. 2 electric motors acting as a C.V.T. ( constant velocity transmission) perform propulsion duty, thus the high mileage rating. True enough, Honda did attempt a break into the “ green” crowd back in 2005 with an Accord Hybrid. To the dismay of Honda fans, the Accord proved to be under-powered, and didn't produce the combined mileage and range expected by consumers and fell off the market within months. Today’s Accord Hybrid is stacking up accolades as it leaves the gate. Honda, a company of many first has hit a home run with the Accord. I expect it to be considered for Hybrid car of the year 2014. The automatic transmission easily permits manual gear changing by sliding the shifter lever to the left and then nudging it fore or aft to upshift or downshift. The hardtop is also compact. When lowered, it fits in the same well as the soft-top behind the seats. With this setup, the top doesn't intrude on the 5.3-cubic-foot trunk, which is decently large for a car this size.